Welcome. 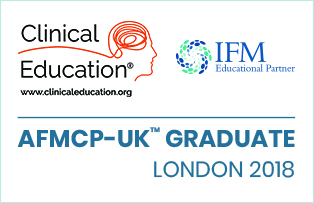 My name is Laila Lewis (BSc Hons, Dip CNM, mBANT, CNHC, Cert., ASK); I am a Registered Nutritional Therapist, graduating in 2010, and I graduated in The Institute for Functional Medicine’s (IFM), Gastroinstestinal Module in 2013 and the IFMs Applying Functional Medicine in Clinical Practice (AFMCP™-UK) Training in 2018. I am also a Systematic Kinesiologist and the founder of Nourishing by Nature. I run a full-time clinic in Cheltenham, Gloucestershire whilst being a team member of The Nutrition Coach in London’s Harley Street. In my eight years of clinical practice I have helped over a thousand people just like you improve their health and well-being. I believe everyone has the potential to achieve optimum health through balancing themselves physiologically and emotionally and that the foundation of this is the unique combination of Functional Medicine, Nutritional Therapy and Systematic Kinesiology. 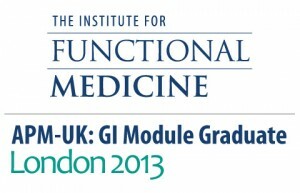 At the core of what I do is Functional Medicine. This approach aims to address the underlying causes of disease and imbalance and involves the client and practitioner entering into a therapeutic partnership. Rather than taking the traditional medical disease-centred approach, this more patient-centred approach works with the whole person and not isolated symptoms and the roots of disharmony are explored. Functional medicine emphasises a definable and teachable process of integrating multiple knowledge bases within a pragmatic intellectual matrix that focuses on functionality at many levels, rather than a single treatment for a single diagnosis. Functional Medicine uses the patient’s story as a key tool for integrating diagnosis, signs and symptoms, and evidence of clinical imbalances into a comprehensive approach to improve both the patient’s environmental inputs and his or her physiological function. Taking this approach means that a consultation involves much more than simply giving a Client advice on what to eat. Yes that is a fundamental part, but consultations involve discussion of a Client’s health history and looking for the interactions amongst genetic, environmental, and lifestyle factors that can influence long-term health and complex, chronic disease. Functional testing and genetic testing is also often recommended as a way to giving detailed information about physiological imbalances. In this way, Functional Medicine supports the unique expression of health and vitality for each individual. The Institute for Functional Medicine teaches health care professional’s how to apply these principles in practice through an intensive 5 day training course called Applying Functional Medicine in Clinical Practice™. 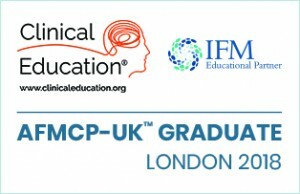 I attended and completed the AFMCP™-UK training in London in 2018. What do I do use to help you achieve optimum health? Nutrition and lifestyle approaches to healthcare have been repeatedly shown to support all the systems of the body and nutritional therapy is the application of nutrition science in the promotion of health and peak performance. In addressing nutritional imbalances the body is supported towards optimum health and vitality. Nutritional Therapists believe that the body has the natural ability to maintain and restore health and work on creating the right conditions for this to occur. To help you achieve this, my mission is to provide you with the support, inspiration and down to earth, friendly advice that enable you to make long-term positive change. I am a fully qualified Systematic Kinesiologist and a member of The Association of Systematic Kinesiology (ASK). I undertook this additional training as I believe Kinesiology is the final missing piece in my practice enabling me to provide my Clients with a 360 degree holistic approach to health. I use Kinesiology to help re-balance clients, particularly on an emotional level. The longer I am in practice, the more I understand that our emotional health has a huge impact on our physical health and both our current emotions and past emotions/traumas are stored in the body manifesting in physical symptoms. Unresolved emotional issues can also cause us to make unhealthier dietary and lifestyle habits such as causing us to overeat or turn to over-exercise or alcohol to escape. Systematic Kinesiology is an amazing tool for helping release traumas and emotions. Only when we are balanced emotionally can we truly find peace and joy in our lives and truly focus on adopting healthy behaviours for the long-term. Please click here to find out more about my approach. How can you be sure I offer a professional Nutritional Therapy, Functional Medicine and Systematic Kinesiology services? 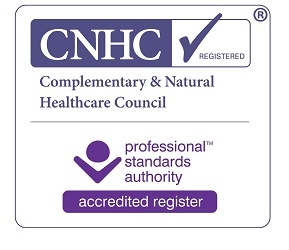 As a full member of The British Association For Applied Nutrition and Nutritional Therapy (BANT) and the government’s Complementary and Natural Healthcare Council (CNHC) you can be confident that I have undertaken thorough, quality training which I keep to to date and that I am fully insured and follow a strict Code of Professional Practice. 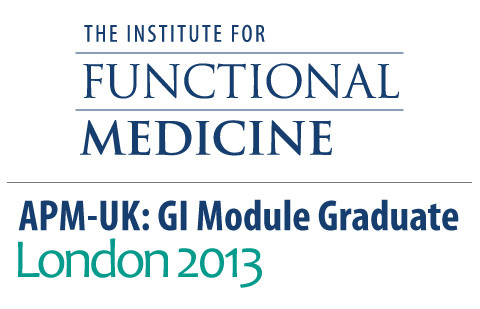 I am also a member of the Institute of Functional Medicine (IFM) and The Association of Systematic Kinesiology (ASK). I am a member of the following organisations. Do you have a particular chronic health condition or symptoms you would like to address? Do you want to find the root cause of your illness? Are you looking for another way to achieve health? Would you like to lose weight? Do you need help identifying the diet and lifestyle issues that are preventing you from healing? Or are you simply looking to increase energy and vitality? If you have answered yes to any of these questions then I would love to talk to you about how we begin your nourishing journey to optimal health. 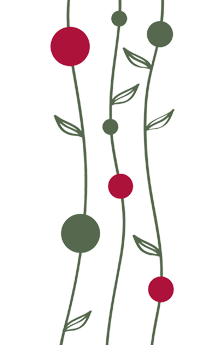 Click here to find out more about how Functional Medicine can help you in Cheltenham, Gloucester or please feel free to call on 07768056048 or email me at laila@nourishingbynature.co.uk to arrange a free, no obligation 15 minute consultation to see how I can help you. Sign up for our free ‘Nourishing You’ newsletter! Laila was very relaxed and easy to talk to and clearly explained how the food I was eating was affecting my health in both the short-term and long-term.